Uppu Puli Dosa is all time favorite of my family. Spicy batter is prepared using rice, tamarind,jaggery,coconut and fresh roasted spices. 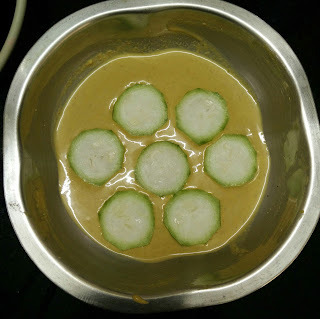 Spicy n Flavourful dosa can be prepared using this batter.To the same spicy batter vegetables like Ridge gourd, Potato, Onion, Cabbage, zucchini can be mixed and healthy vegetable dosa can be made out of it too. 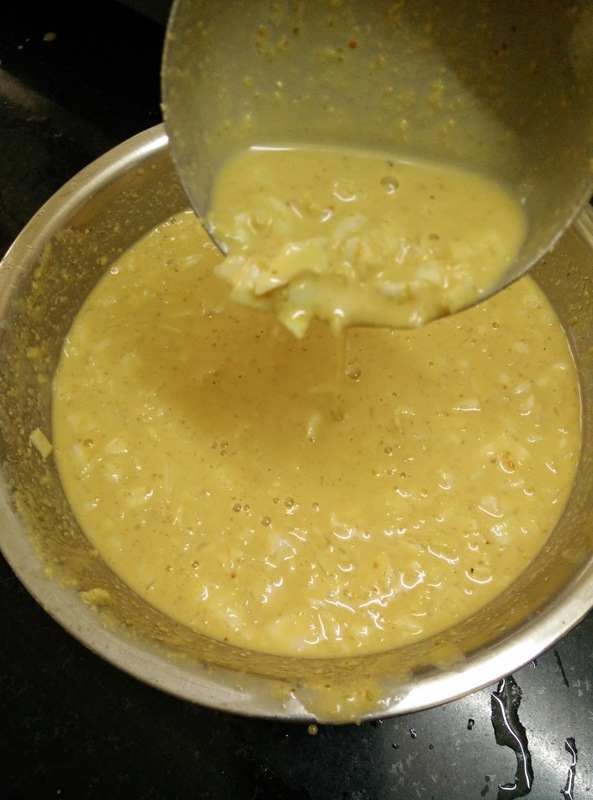 Enjoy as breakfast along with grated jaggery and fresh butter on top. Serve this as heavy healthy evening snack for kids. 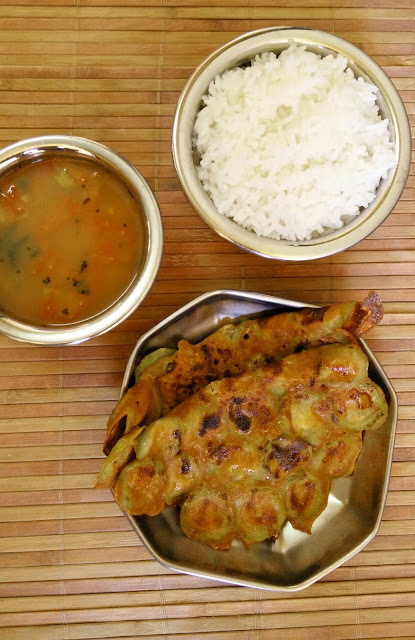 Serve potato spicy dosa /ridge gourd spicy dosa /zucchini spicy dosa as a side dish along with hot rice,rasam and spoonful of coconut oil. 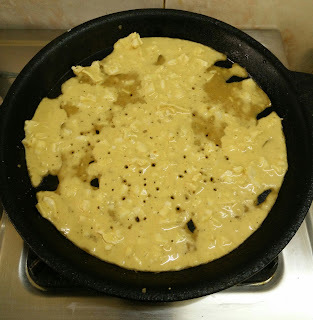 First let us look at how to prepare the uppu huli dosa batter (spicy dosa batter) ? 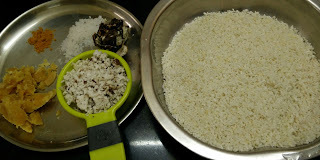 Wash and soak the rice for 1-2 hours. Using little oil, roast all the ingredients mentioned under "for roasting" till you get nice aroma. ( Please don't burn the spices) one after another. Let it cool down completely. Drain the rice and transfer it into a mixie jar. Now add in all the roasted spices, tamarind, jaggery, salt, turmeric powder and coconut into the same jar. Using sufficient water grind everything into a smooth batter. ( Consistency should be like pakoda batter, neither too thin nor too thick). Check for the salt again and adjust. 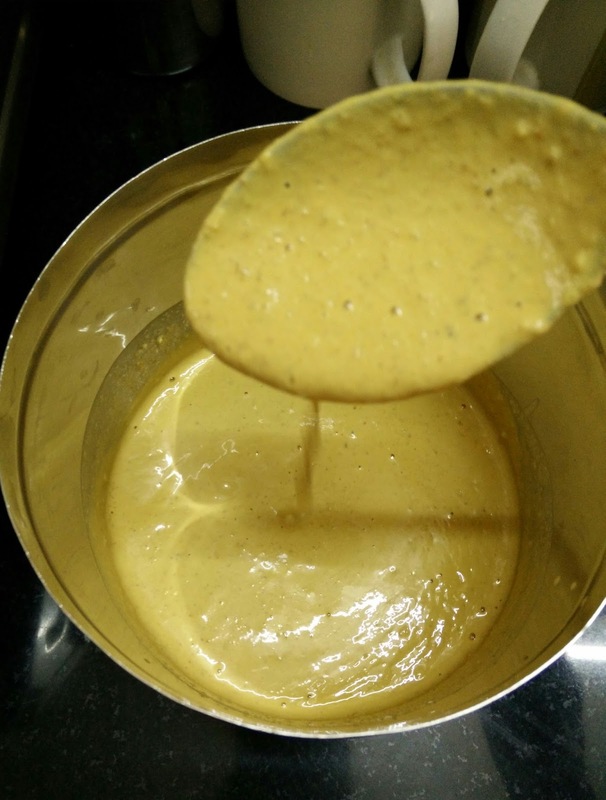 Now we are done with spicy batter preparation.Let us proceed to see how to prepare plain spicy dosa and veggie dosas? 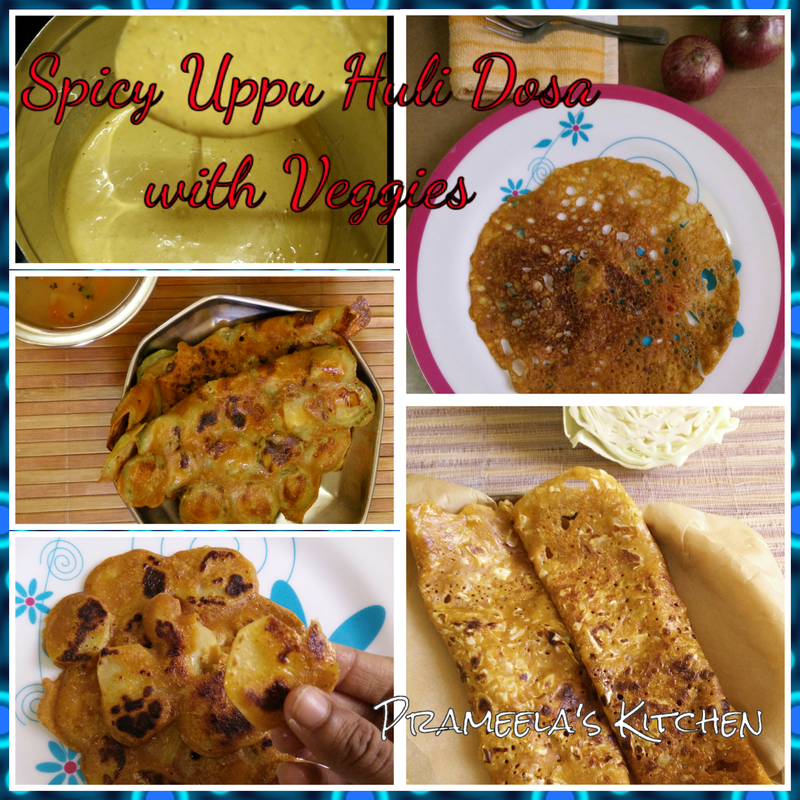 1) How to Prepare Uppu Huli Dosa /plain spicy dosa without veggies? Add water to the batter and get the consistency of normal dosa batter. Heat the dosa pan and grease with one tsp of oil. Once the pan is hot enough, pour a ladle full of batter in the center of the pan.Spread in a circular motion to form a dosa of circular shape. You can also make the batter very thin and pour like neer dosa. 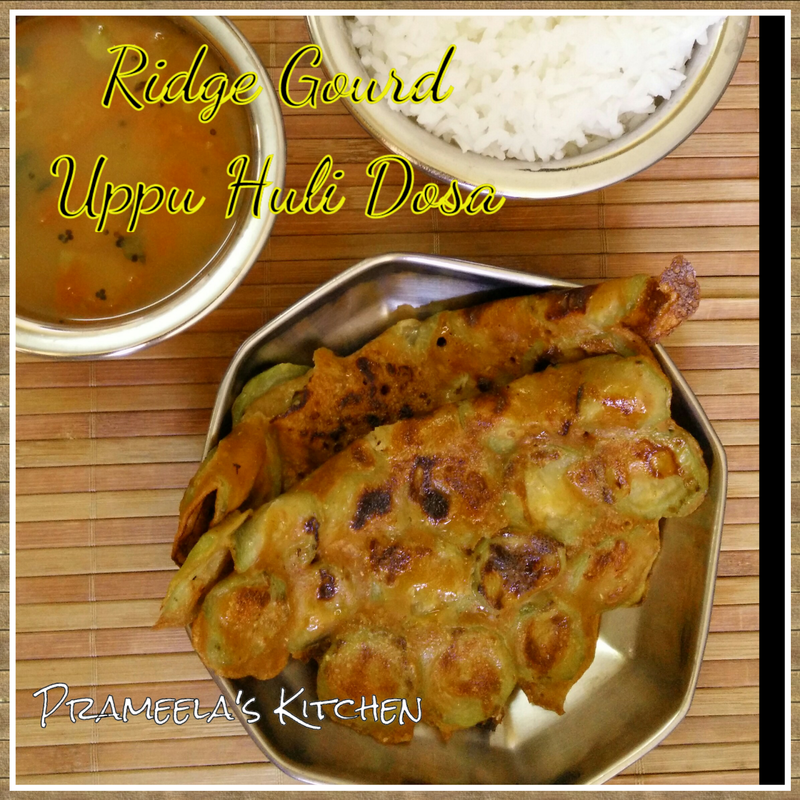 2) How to Prepare Potato Spicy Dosa, Ridge Gourd Spicy Dosa ? 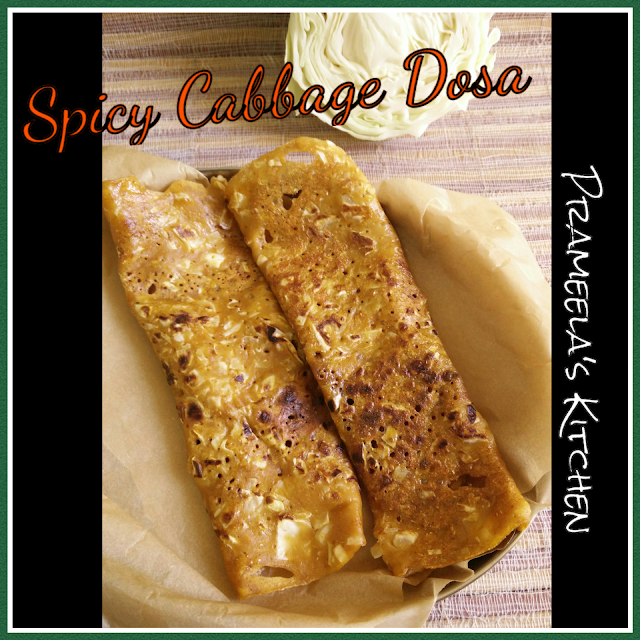 3) How to Prepare Onion Dosa and Cabbage Dosa ? 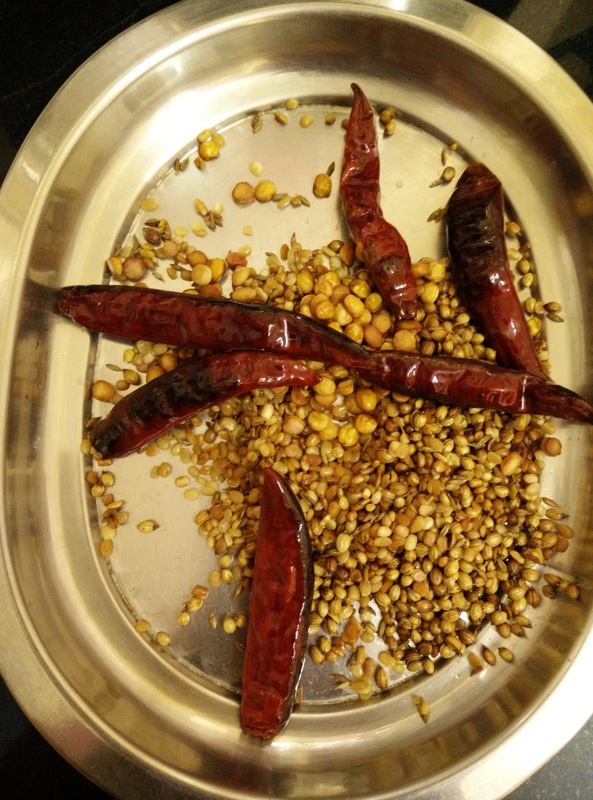 You can use 2-3 table spoon of sambar powder instead of roasted spices while grinding as a shortcut. I have seen my aunt preparing mixed vegetable dosa too. 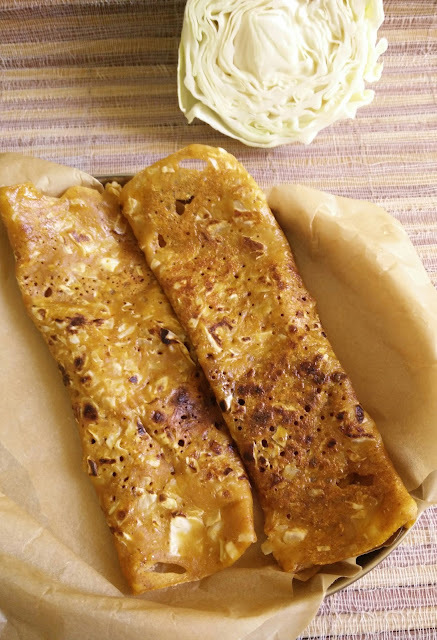 You can do so by mixing grated carrot, grated cabbage,and fine chopped onion into the batter. 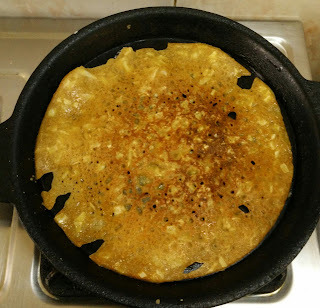 You can add chopped methi leaves to the batter and can prepare methi leaves spicy dosa too. 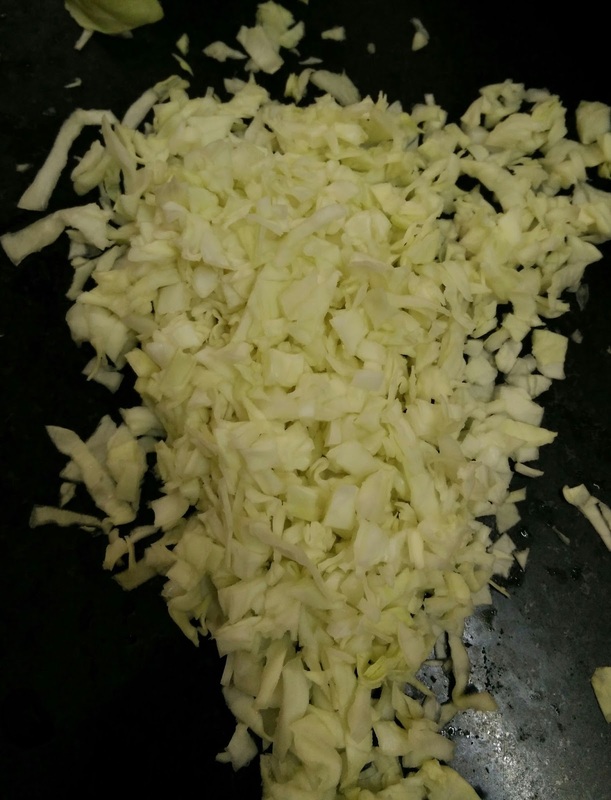 I have also seen friend of mine, grinds 1-2 onions along with other ingredients in the beginning it self while preparing the spicy batter. By mistake if you have added more water and the batter is too thin , then add in 2-3 tbsp of rice flour to make the batter thick. 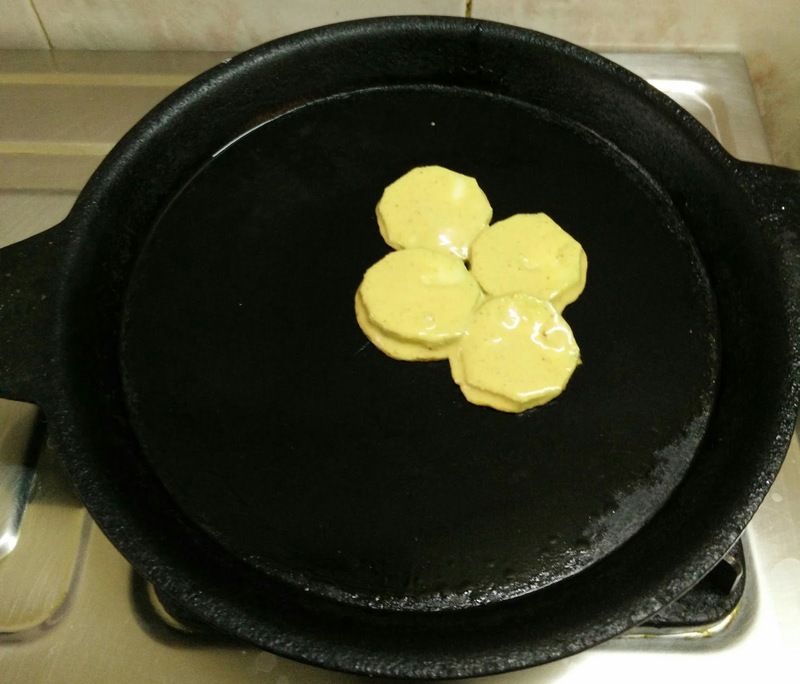 I usually use iorn dosa pan and its very good for health. Thanks for going through my recipe , your feed back is always welcome :-).Kindly share the recipe with your friends and family if you like it. Peel the outer skin of ridge gourd. Now chop them into thin slices. Drop these slices into the batter.Heat the dosa pan and grease with one tsp of oil. 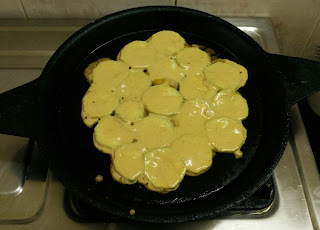 Once the pan is hot enough, Dip the potato slices in the batter and place them on the pan one after another. 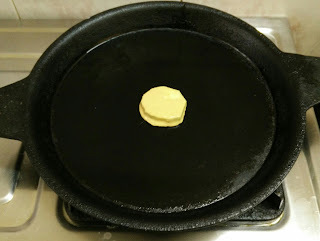 Form a circular shape like dosa. 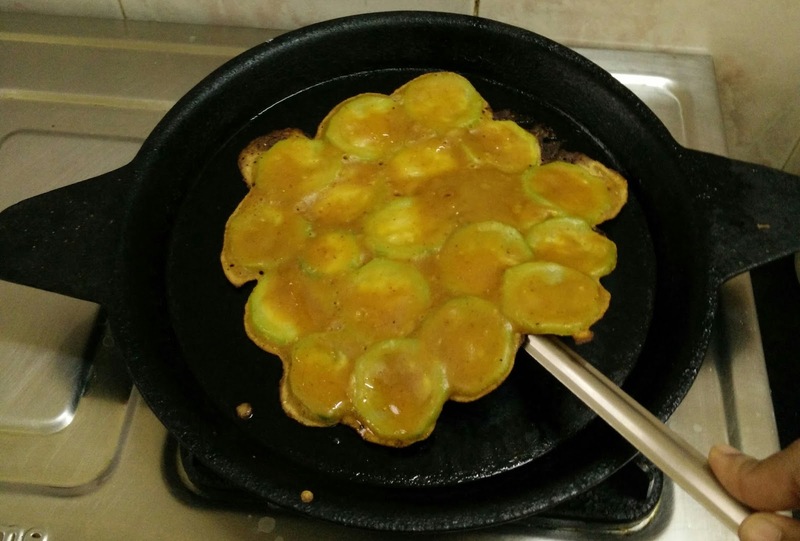 At this stage, if you see gaps in between the slices on the pan, Fill in the gaps using 1-2 tsp of batter. Cook the dosa by covering the lid in a medium flame.After a 1-2 minutes, add 1 tsp of oil,flip the dosa and cook the other side too. Make sure potato is cooked nicely. 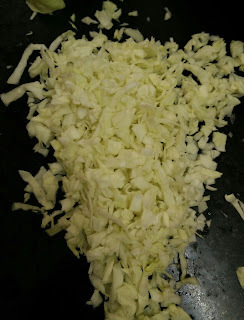 Finely chop cabbage into small pieces. Add these veggies into the batter. Add in adequate water to make the batter very thin. 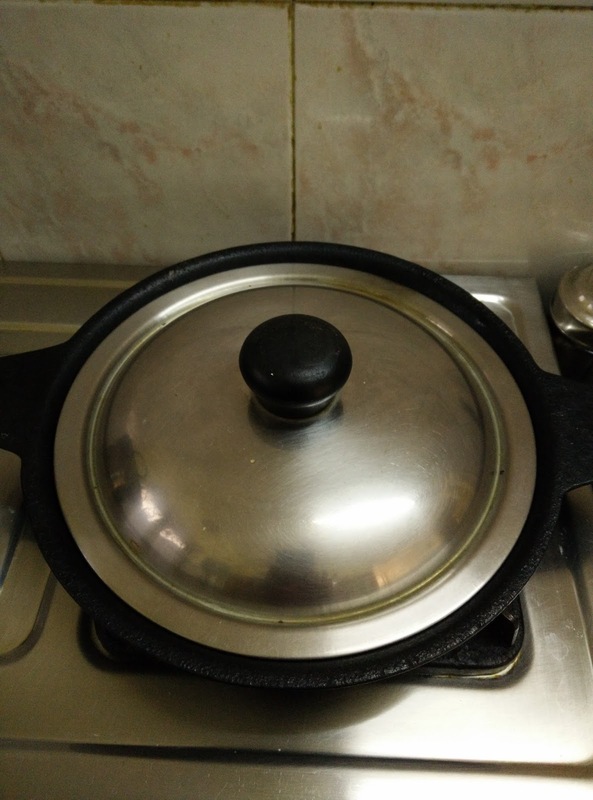 Heat the dosa pan and grease with one tsp of oil.Once the pan is hot enough,take a ladle full of batter and just pour on the pan like neer dosa. 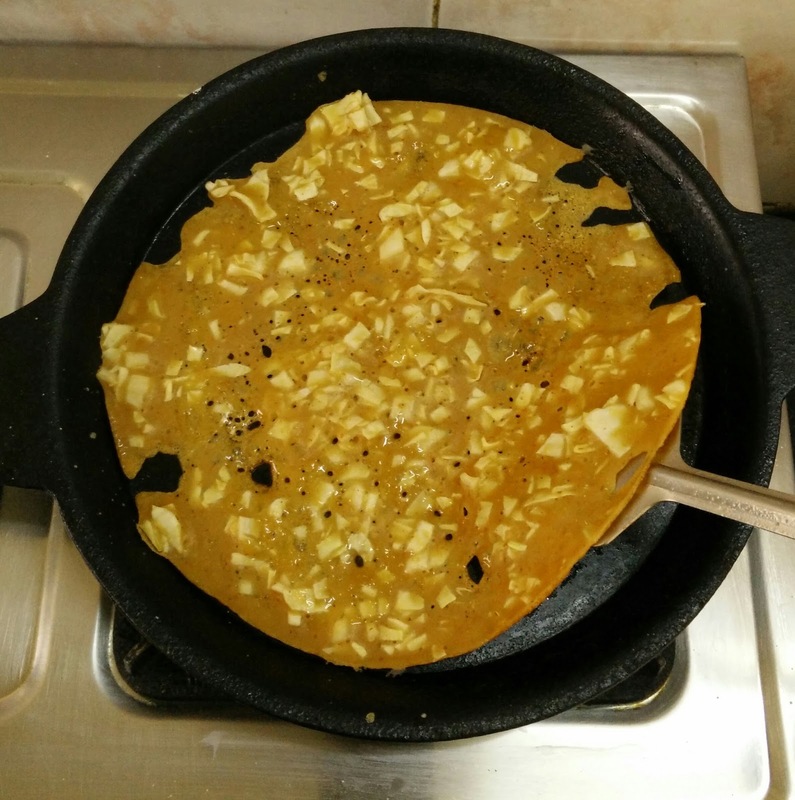 Cook the dosa by covering the lid in a medium flame.After a 1 minute, add 1 tsp of oil ,flip the dosa and cook the other side too. Make sure veggies are cooked nicely.